`It will be widely welcomed for the deep grasp of Eriugena's thought which manifests and communicates, for its comprehensive range, its mastery of a voluminous secondary literature, and the didactic skill which is everywhere in evidence.' J.McEvoy, English historical Review. This book deals with Johannes Scottus Eriugena, an Irish scholar at the Court of Charles the Bald in France in the second half of the ninth century - to be clearly distinguished from John Duns Scotus (1264-1308), after whom `Scotist' philosophy is named. 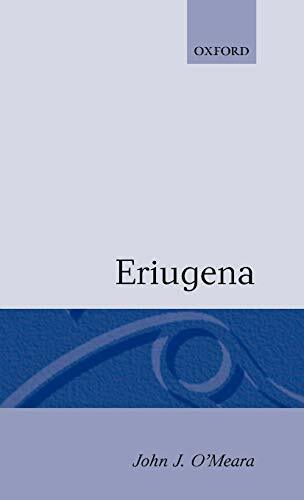 Eriugena's main work, Periphyseon (de divisione naturae), is a remarkable attempt at a real intellectual synthesis between the Bible and Neoplatonist philosophy. It was not looked upon with great favour in the West except by the mystics and, more recently, by German Idealist philosophers of the last century. Now, however, because of the growth of interest in Medieval Studies, there is an increasing curiosity about Eriugena and his work - but there has been no comprehensive book about him since that of M. Cappuyns in 1933. Bringing together the results of the most recent research on Eriugena, this book discusses his background in Ireland and life in France, and of his career as teacher, controversialist, translator, and poet. It gives an extended and careful summary of the Periphyseon, and the first translation into English of the brief Homily on the Prologue to St.John's Gospel.